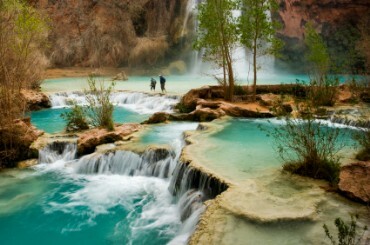 They are at Havasu Falls on the Havasupai Indian Reservation. 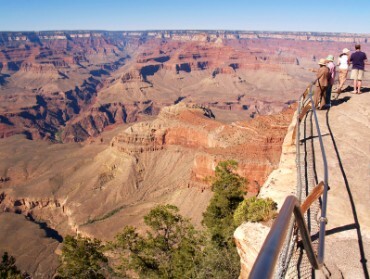 It was made by water from the Colorado River. 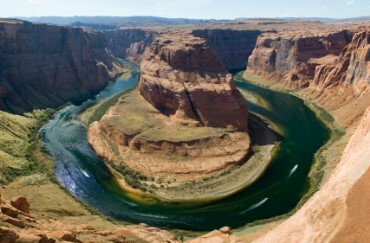 This section of the Colorado River is called Horseshoe Bend because it is shaped like a horseshoe. They are looking at the Grand Canyon. They are standing behind a railing so they won't fall. Copyrights to the pictures and photos on this EL Civics website belong to individual photographers. We have purchased the rights to use them. Do not copy the images on this educational website. Permission is granted to copy any of the worksheets for classroom or home study. Contact Christina Niven, ESL teacher, at christina@elcivics.com. Please send corrections, comments, and requests for new ESL and civics lessons. Copyright © Christina Niven, 2007.